It happens sometimes: I enter a space and find myself instantaneously transported to past selves and worlds. It had been an idyllic January day; my husband and I had spent the entire morning and afternoon cruising down the Pacific Coastal Highway, which offered wholesome views wherever and whenever we looked. My camera slideshow revealed one postcard-perfect picture after another: foam-flecked jade seas; ancient, regal cypress trees; cerulean blue skies; and finally, an icy, fiery sunset at a beach where a family of elephant seals had congregated to celebrate the day’s conclusion. Newly married and having moved to the United States just a month ago, I was still dealing with the residue of cultural jetlag; this holiday was a perfect break. As we sped through the darkness en route to Santa Barbara, I marveled aloud at the visual treasures the day had offered us. In search of a caffeine and sugar fix, we stopped at Madonna Inn, having heard much about its quirky interiors and rooms. As we walked across the parking lot, I could still smell the sea in my hair and hear the wind swirling around me as if I was inside a conch shell. However, as soon as I stepped inside the hotel, the day’s postcards vanished from my mind. 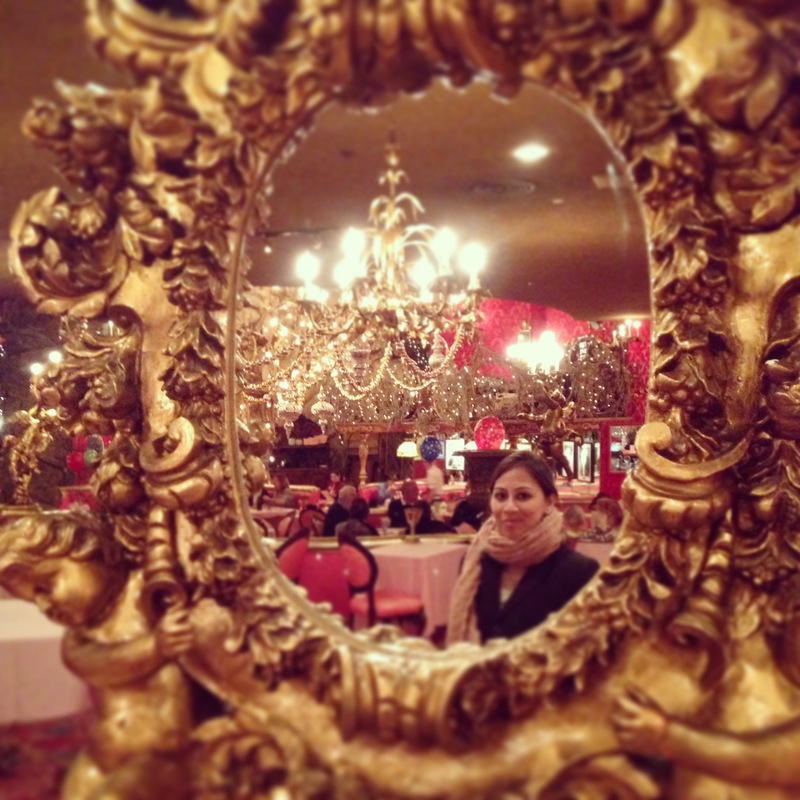 Surrounded by hot pink walls, ornate gold mirrors, massive chandeliers, and rainbow grapes, I found myself in a much-frequented haunt of my childhood: the interior of an eighties/nineties Hindi film. In an essay entitled “Home Stretch” in Elle magazine (June 2013), Courtney Hodell pertinently writes about the significance of a house/home in her life: “a house and its objects are a cup to contain our liquid, uncertain selves.” The objects that adorn our coffee tables and the art that hangs on our walls collectively contribute to transforming our spaces. They are unique to our personalities—spatial fingerprints. We perform many selves, donning different personalities for different people and occasions. The interiors of our homes are the theaters for these performances, and we rely on props in form of books, paintings, and knick-knacks to present this gamut of protean selves. My fascination with these performative spaces began during childhood, growing up in the Persian Gulf during the late eighties and early nineties. My family subscribed to a daily Dubai-based newspaper, Khaleej Times; it came a day late across the border, and my brother and I used to fight over who would read its children’s magazine, Young Times, first. They also published a weekend magazine, which came out on Fridays and was simply called Weekend, featuring a motley assortment of syndicated articles from British women’s magazines, columns chronicling the Dubai social scene, and ghost stories. I spent many hours poring over the sections on home interiors, for both their visual appeal and the stories of those who inhabited these spaces. These columns usually featured homes deemed outstanding in terms of layout, design, and decor/styling in United Arab Emirates, usually belonging to expatriate residents. I studied the photographs and read about how the owners assembled the variegated objects and paintings and furniture to create their homes, which often appeared to be portmanteau versions of those they had left behind. I wondered if our home would ever be featured in that column. Which stories would our rooms perform through their accessories—my mother’s Rajasthani miniature paintings, framed vintage family photographs, sculptures of Hindu deities, Czech crystal bon-bons? I closely inspected how people chose to dress up their homes. I created portraits of their lives from the contents of their rooms, inventorying all the journeys they took before coming and setting up their homes there. The houses I visited generally bore a trademark Persian Gulf look: brocade upholstered sofas, Arabian carpets, plenty of crystal and glass, gold accents. They tended toward excess and lavishness, the extent of which varied depending on personal tastes and inclinations. These homes were my address for familiarity, just as the homes depicted in the eighties/nineties Hindi films we watched were immediately familiar as well, despite my distance from India. The Hindi films claimed citizenship in the country of Kitsch: sprawling bungalows, mismatched furniture, carpets, wallpaper, paintings, and faux metal knick-knacks. The sets did not aspire to authentic representation; rather, the goal was to create a fantastical, escapist reality, far removed from the mundaneness of ordinary lives. The more I reflected upon it, was it not a similar case with the homes I encountered in the Middle East? The rooms emulated Bollywood as an ode to the homeland, while the décor, the ambience, and general visual appearance were carefully cultivated and curated to reflect an aspirational Middle Eastern lifestyle. These houses were ornate and grand, an interesting coexistence of nostalgic narratives of home and interpretations of the current life away from home. The constructed excess of both the homes in films and the ones in which we watched them contributed to and, indeed, constituted my understanding of interior design at that time. Hindi films from the nineties arguably did not distinguish themselves in most aspects of filmmaking, and aesthetics and design were certainly no exception. Anyone who has watched Bollywood film from that era can testify that detailed attention to art direction was a great rarity, barring a few exceptions, such as Yash Chopra’s Lamhe (1991). In that decade, set design was, more often than not, incidental to the narrative, a mere backdrop. It was not until Dilwale Dulhaniya Le Jayenge (1995) and Kuch Kuch Hota Hai (1998) that Karan Johar, the auteur of aesthetics, fine-tuned art direction. His singular attention to visual elements in his filmmaking made design as much a matter of priority as the appearance of Kareena Kapoor or Kajol. Later films follow this trend: in Sanjay Leela Bhansali’s Devdas (2002), critics observe that the director consciously constructed operatic backdrops in consonance with the film’s high-octave notes. In an interview with leading Indian women’s magazine Femina (July 2002), the film’s costume designer Neeta Lulla revealed how she meticulously calibrated the color palette of Aishwarya Rai’s saris so that it would mesh with the film’s vividly colored sets. As Hindi films increasingly subscribe to the grammar of authenticity and/or conscious kitschiness in productions such as Dabangg (2010) or Himmatwala (2013), Hindi television programming seems to have assumed the baton of theatrics instead. In recent years, Hindi-language television producers have spent significant amounts of money on recreating rural Rajasthan, urban Gujarat, and miniature villages. Often, while watching shows such as Kasauti Zindagi Ki or Kyunki Saas Bhi Kabhi Bahu Thi, I wonder what it would be like to wander the sets of these shows. Each sought to recreate so accurate a cultural milieu that it was impossible to distinguish the ersatz from the authentic. Can watching these television shows and films assuage feelings of homesickness? Do new immigrants adorn their surroundings with as many reminders of home as possible, creating a shrine of nostalgia and yearning? When I first left home and moved to the United Kingdom for my undergraduate studies, one of the first things I did was drape a lime green and maroon embroidered Kashmiri shawl upon the chair of my bare, matchbox-sized room. The shawl had belonged to my mother when she traveled from India to Australia many years ago to pursue her graduate studies, and now it injected the room with color, my mother, and home. When I was growing up, I engaged with India through the sense of home created from Hindi films. Sitting in my living room in Oman, I conjured up notions of how my homeland and its people looked by peeking into the sets of their living rooms and bedrooms. Though I visited India annually, the first days back always seemed tinged with a cinematic unreality, as if I was no longer a spectator and had stepped inside a film. As my body adapted to the change in time zones, I felt my mind reconciling to the truth that we were in the depths of real India, not the manufactured one in the films I had been accessing all this time. The Internet revolution has brought us closer to one another than ever. The same nostalgia is perhaps no longer applicable since I can Skype with my loved ones every day. If I am homesick for the sights and sounds of my country, I experience it through audio-visual clips; if I am hungry for comfort food, the Indian grocery store is just around the corner. The homeland is no longer so remote. Perhaps only now can our homes be tabula rasas, liberated from becoming shrines to the past. 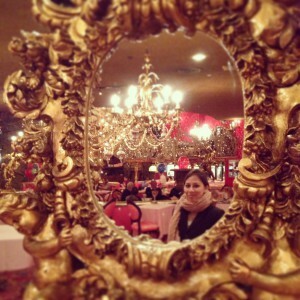 As I walked around Madonna Inn, I intuitively viewed it through the prism of the familiar. It was maximalism, theatrics, and kitsch; it could easily have been a bungalow uprooted from a Hindi film or the Gulf and transplanted to California. I had not expected to return home in this hotel thousands of miles away. For that brief moment, I had fallen, Alice-like, through a black hole and tumbled into a fantastical, yet familiar, land. Priyanka Sacheti is a writer based in Pittsburgh, United States. Educated at Universities of Warwick and Oxford, United Kingdom, Priyanka previously lived in Muscat, Sultanate of Oman. She has published numerous articles, with a special focus on art and gender, in various publications such as Gulf News, Brownbook, and Khaleejesque. She is the author of three poetry volumes, co-authored an English-language instruction publication, and two of her short stories have been published in international anthologies celebrating Indian immigrant writing. An avid amateur photographer, she explores the intersection of writing and photography on her blog and Tumblr.